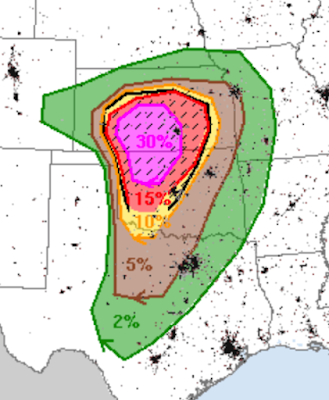 I don't see any reason to update my version of SPC's forecast (below). I mentioned OKC as an area that should prepare for the possibility of a tornado in my commentary and they now seem to agree. The 5% tornado area (the significant threshold) has been extended south and now includes the Ft. Worth area. My advice, below, still stands. Charge cell phones and laptops. It is now time to prepare your sheltering plan. Basement, under strong furniture (eg, pool table) or under the stairs is a good idea -- but do not shelter right next to your hot water heater. It could tip. If you do not have a basement or safe room, a bathroom or closet in the middle of the house on the lowest floor is your best protection. If you can get the bathtub, great. If you want to wear a helmet or hard hat, great. If you live in a mobile home park, make sure -- now -- your shelter is open and available. If there is no shelter, you will need to seek shelter before any large thunderstorm arrives. Ask a friend or relative if you can shelter in their home. Wear solid shoes into your shelter. Take a flashlight and your (charged) cell phone. Late addition: Remember your pets. You might wish to put your "thunder coat" on your dog now or as soon as the storms begin to form. Thank you to our commenter (below) for reminding me. Again -- no reason for great concern. Just be prepared to act if a tornado warning is issued. Good luck!! P.S. I no longer live-blog storms. For that, follow me on twitter @usweatherexpert . However, I will update this forecast by mid-afternoon.